Although it looked somewhat like its predecessor the F4F Wildcat, the single-seat F6F Hellcat was a completely new design from Grumman. It was a carrier-based fighter that served in the US Navy and US Marine Corps (USMC). The Hellcat is credited with destroying a staggering 5,271 enemy aircraft. 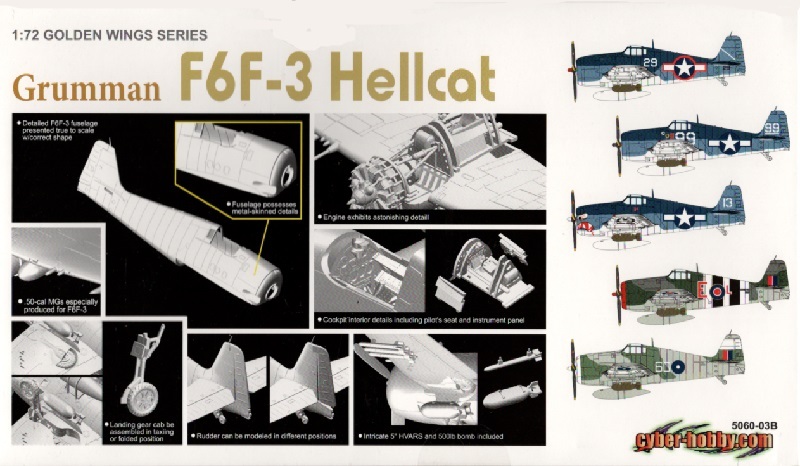 Cyber-Hobby is releasing a 1/72 scale plastic kit of the first production version of the Hellcat, the F6F-3. In all, some 4,402 F6F-3 carrier-borne fighters were produced up till April 1944 before it was replaced by the F6F-5. 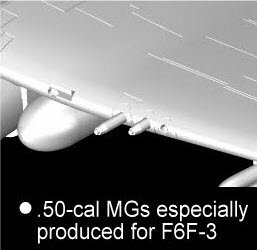 The fighter’s standard armament was six .50-cal M2/AN Browning machine guns, while later aircraft possessed three hardpoints capable of carrying 900kg of bombs. Six High-Velocity Aircraft Rockets (HVAR) could also be mounted under its wings. This is a 1/72 scale kit from Cyber-Hobby. 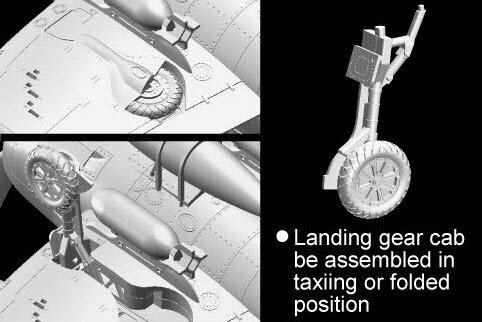 It’s based on the F6F-5N (Item No.5080) that was released earlier, but it has a modified fuselage in keeping with the design of the F6F-3. 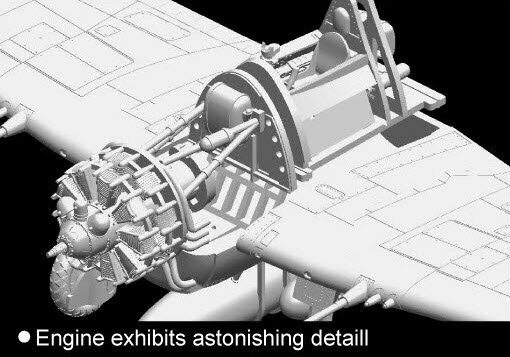 Details such as the Double Wasp radial engine are absolutely stunning. 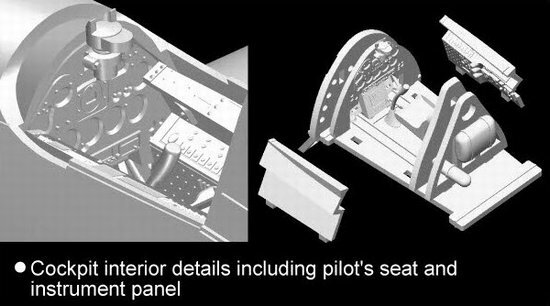 The cockpit features a full interior, with even minute details rendered. 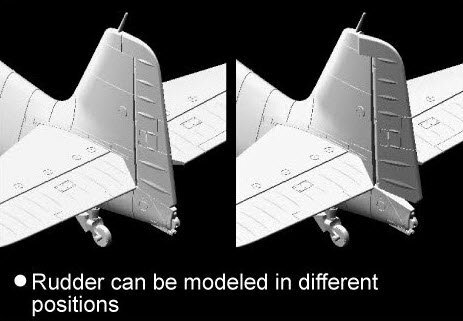 The transparent canopy can be displayed open or closed, thus allowing the modeler to show off all the intrinsic detail. The wings can be shown extended or folded, as can the undercarriage. 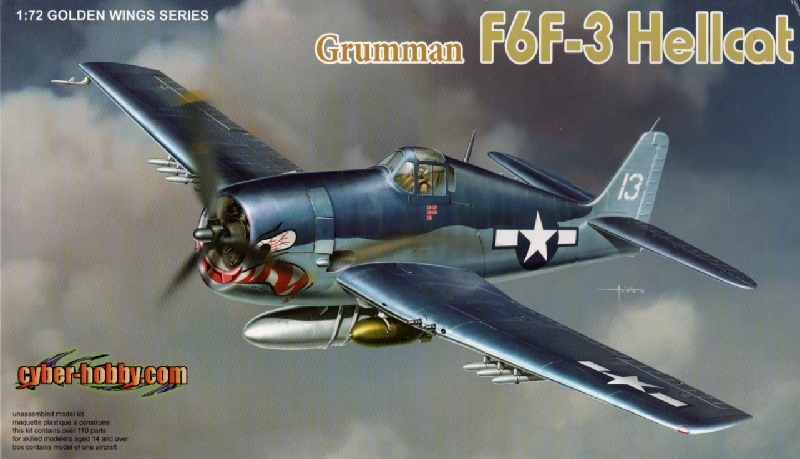 Cartograf decals offer various US and British unit marking options for this famous Hellcat fighter. 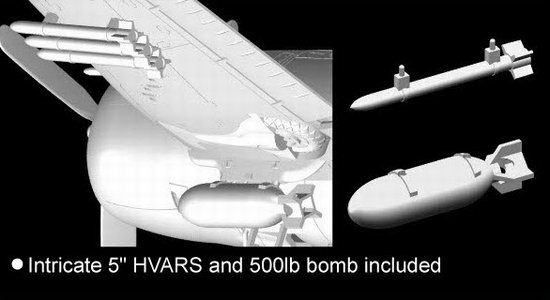 The kit also comes with a selection or armaments (e.g 5-inch HVAR, 500lb bomb) to produce an authentic-looking model. This might be a Hellcat, but it will cause aircraft modelers to purr with delight!